Greetings from the GREAT WHITE NORTH! Today we went to Banff for half a day. We spent some time in the Upper Hot Springs, then had lunch in town. I got to spend a day in Edmonton with my family. It was a lot of fun, seeing EVERYONE, and eating, eating, eating. I also received more Christmas gifts on my trip. I feel overloaded, and very blessed. It’s too cold here, but I’m sure it’s just as cold as Denver. I miss my kitty cat. I know she’s in good hands with the cat sitter. Once we get home in a few days, I’ll post the pictures I took. Well, I hope you all are enjoying your holidays. I’ll try to post again soon. I’ll close with some lines from Soapdish (I love Kevin Kline). Jeffrey Anderson: [as Dr. Randall] I will if it’s that sample. Huh… I wish it was that simple. Jeffrey Anderson: [as Dr. Randall] The test results have come back. Celeste Talbert: [as Maggie] And? Jeffrey Anderson: Bran… fluid. Bran flavor. Celeste Talbert: [as Maggie] Brain fever! Celeste Talbert: [as Maggie] Literally explode? Jeffrey Anderson: [as Dr. Randall] Exactly, within the next three houses. Celeste Talbert: [as Maggie] Hours? Jeffrey Anderson: [as Dr. Randall] Yes, will literally explode within next three hours. I would suggest leaving the restraint. Celeste Talbert: [as Maggie] Restaurant? Jeffrey Anderson: [as Dr. Randall] Restaurant, yes. Celeste Talbert: [as Maggie] Her brain will actually explode? Jeffrey Anderson: [as Dr. Randall] Yes, yes, I’ve, um, seen it happen. It’s a dreadful, dreadful thug. Thing. Armstrong Christmas Letter 2003 & Christmas morning picture! Ho Ho Ho! Merry Christmas! I hope your holiday was a joyous & blessed event. We had a lovely time at church Christmas Eve, though I did start crying during the service. It was a hard night, and it was painful to think about my Papa. After service we went to the Jones’ which was awesome! They are a great family, and they have great family & friends. There was Catch Phrase, and Mad Gab, and 4 different soups to eat. We didn’t get home until late. Geoff was afraid we’d miss Santa (but he didn’t come). He apparently left us gifts at Glen & Diane’s, so we’ll pick those up next week. I got some neat stuff…DVD’s, chocolate, candles, a C.S. Lewis book, and a gift certificate for iTunes! Whoo-hoo! Tonight we’ll feast on lasagna, and for dessert scotch shortbread cookies. Mmmmm. I’ll close with a quote from one of my new DVD’s, When Harry Met Sally. Harry: The fact that you’re not answering leads me to believe that (a) You’re not home, (b) You’re home but you don’t want to talk to me, or (c) You’re home, desperately want to talk to me, but you’re trapped under something heavy. If it’s either (a) or (c), please give me a call. Tomorrow is Christmas Eve. Holy Moses did this month fly by. This year too. As is the Armstrong tradition we will go to church tomorrow. We were lucky enough to receive an invite from the Jones’ to come over after church, so we will go. It should be like Thanksgiving, according to Curt. I had a lot of fun on Thanksgiving. I’m a game person, and they are a game family. What a fit we are. We will also watch the Mr. Bean Christmas episode, and The Toy That Saved Christmas. Geoff is anticipating us waking up at 6am Christmas morning to open presents, but we’ll see. Geoff’s family has a tradition of cinnamon rolls Christmas morning, so that is a certainty in our morning. And Geoff is making lasagna for dinner on the 25th. We went to Whole Foods to buy some italian sausage & cheese for the dinner. Yummy. I hope you all have a blessed holiday season. We will be online Christmas morning if you want to IM us. I’ll close with a quote from A Charlie Brown Christmas. Linus Van Pelt: Sure, Charlie Brown, I can tell you. Lights, please. (A spotlight shines on Linus.) “And there were in the same country shepherds abiding in the fields, keeping watch over their flocks by night. And lo, the angel of the Lord came upon them, and the glory of the lord shone round about them, and they were sore afraid. And the angel said unto them, Fear not, for behold, I bring unto you good tidings of great joy, which shall be to all people. For unto you this day is born in the City of Bethlehem, a Savior, which is Christ the Lord. And this shall be a sign unto you; you shall find the babe wrapped in swaddling clothes and lying in a manger. And suddenly there was with the angel, a multitude of the heavenly host, praising God, and saying, ‘Glory to God in the highest, and on Earth peace, good will toward men'”. That’s what Christmas is all about, Charlie Brown. It’s been brought to my attention, that my Top Five Places To Eat At In Edmonton, does not accurately describe the places I eat. So, Elephant & Castle, while a tasty place to eat, couldn’t be on my top five because I didn’t eat there often. So it was removed from it’s number four spot, and replaced by KFC. Because, as my friend pointed out, I was always there on Toonie Tuesday. Thus, all last night, I was dreaming about KFC. MMMmmmmm. I’m so tired of shopping. I hope to avoid being in a store or mall until January. But while I was picking up a few items for our trip to Calgary, I went by Foley’s to see if the price had dropped on the sweater I had mentioned in an earlier post. And it had dropped $10! Yay! So I took the last one in the color I wanted, and at the counter they took another 15% off. 🙂 My $30 sweater was only $15. Can I shop or what! Geoff was asking about the Top Five list on my blog, specifically how I came up with the songs on the list. These are my own choices, reflecting what I’m listening to that week. I do hope to expand the musical horizons of my loved ones. Just as friends have done for me. I can hardly believe Christmas is 5 days away. We’ve been feeling sad thinking about those we’ve lost in the last year & a half. Namely my dad, Grandma Bessie, and Grandpa Jim. We received some posessions of theirs, and it made us miss them. But now we have things to look at to remind us of them. I don’t have anything of my dad’s, I just have pictures. But eventually I’ll bring some stuff down here, I hope. I’ll close with a quote from Lewis Black, regarding the Atkins diet and the energy bars that Dr. Phil is hocking. The energy bars come in Apple or Pear, but those aren’t the flavors. That is suppose to be your body type. “If you look like an apple or a pear, eat an apple or a pear. It doesn’t taste great, but hey, at least it’s not bread”. We’ve only found one place here we like to frequent that is distinctly Denver, The Bull & Bush. It’s a quaint pub down the road from us, and the food is fabulous. We’ve been twice, and we hope to make a monthly ritual. Geoff loves that he is able to enjoy a scotch after dinner, getting to try a variety of scotches. Mmm, the trend in case you don’t see it, is they have to serve gravy with their fries. 🙂 It’s a Melissa thing. Today is the day…I’m going to bake gingerbread cookies. I’m a little concerned. But how do you learn to do something well, you practice. To keep with the top five theme of this post, I will close with a quote from one of my favorite movies, High Fidelity. Rob is speaking about “the musical moron twins”. Rob: I can’t fire them. I hired these guys for three days a week and they just started showing up every day. That was four years ago. It was wonderful. My legs hurt by the end, but it was such a payoff. Worth the wait. Thank you Peter Jackson! We went to see it in the afternoon, and every seat was taken. 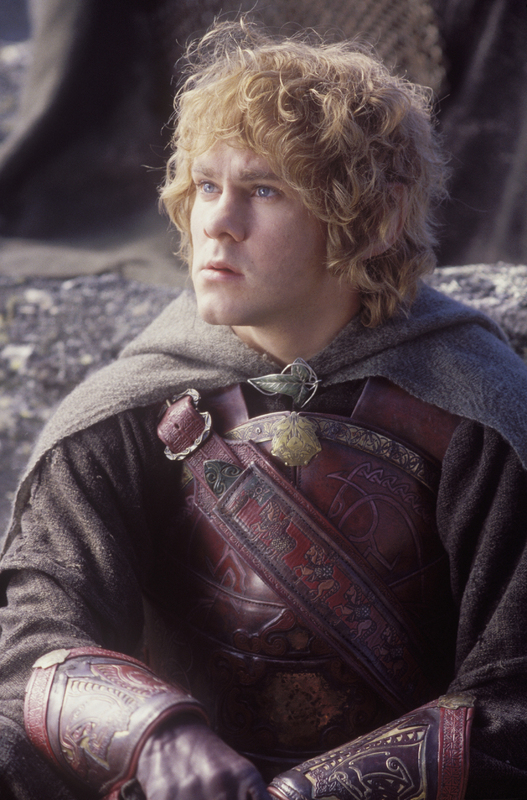 My favorite characters have always been Samwise & Meriadoc (hence the picture of Merry). Sean Astin was wonderful, as was the whole cast, so i’m a little bitter that the cast was ignored by the Golden Globes. Figures, but at least Peter Jackson got a nom. I hope the Oscar folks will be kinder. I brought some kleenex in case I had to cry, but I just kind of swallowed it. It was pretty true to the book, and Geoff thought it was the most true to the books out of all three movies. If you haven’t read the books, I will write some stuff in inviso-text so as not to spoil it for you. I wanted to cry when Pippen & Merry were separated, but that part broke my heart reading the book. Also, at the end when all the Ring-bearers prepared to leave on the ship. 1 day until Return of the King. Tomorrow’s the day! Yay! I’m trying to keep the excitement in check, I’d not to be able to accomplish anything else because I’m obsessing over a movie. Work at DMNS was great yesterday. While my boss was gone, I got to know the 2nd in command, Rich. I learned a lot, and I catalogued my first artifact. While my drawing of it sucked, I was at least descriptive. I also helped to move a 200 lb rock. Things will be slow in our dept. until after the holidays, but I may try to clock some more hours. Everything else is good I guess. I have to work on the spare bedroom a little more to make way for the bed that is coming. Looking at the room, it’s hard to imagine a bed fitting in here. That’s all from here. I’m out of control adding things to my Amazon wishlist. But season 1 & 2 of Newsradio comes to DVD in February! How could not add that? I’ll include some quotes so you get how awesome it is. Lisa: I think that one’s probably from Milos, the janitor. Dave: Oh. Refrigem—oh, then that one’s legitimate. Bill, Beth, Lisa, Matthew, Joe: SHAFT! Bill: I thought we’d all enjoy that. Dave: [reading one last card] And, “Help, I’m being held prisoner in a complaint box,” which is actually kinda funny. Song I can’t stop listening to is Hanging By A Moment by Lifehouse. 4 Days until Return of the King, and I’m pretty excited. We bought our tickets today, which kicked the excitement into high gear! Best of all we’ll get to see it on a large screen. Wheee! Alright Christmas, go ahead and come. All the shopping is done, and all the shipping is done too. We fed-exed everything this morning. Huge weight off my shoulders. With my birthday in less than a month, I’ve already started looking at stuff I may want, in case I don’t get it for Christmas. I rarely buy anything in the time between Christmas & my birthday just to be safe. Or I’ll check with people to see if it’s okay. I found a fabulous sweater at Foley’s that I have my eye on, in the case that I get money at Christmas. Normally I wouldn’t shop Foley’s, but it’s a good price for a sweater, though I’d love it if they dropped the price even $10. We’ll see what happens. I finally convinced Geoff he needed new boots, as his have been leaking in the sole. We’ll keep the old ones for camping. I’ve been in kind of a weird state the last few weeks. I’ve felt the strong desire to renew old friendships. Actually, it’s been longer than a few weeks. I got reacquainted with a friend from high school this past spring, and now we’re trying to keep in touch via email. She & her husband are trying to conceive, so it’s exciting to share that experience with someone. We are also trying to conceive, in case you didn’t know. I also emailed an old friend that I lost touch with a few years ago. I don’t quite know what brought on these feelings, but I’m just going with it. I thought about emailing a friend I had in junior high, but I wasn’t sure that 1. He would remember me, and 2. that he would want to hear from me. I’m giving it some more time to think about. I had a lot of friends in junior high, but I didn’t go to high school with many of them, so I doubt they’d remember me. Does anyone else feel like that? I read a great book this week, Party Monster by James St. James. It was originally published under the title Disco Bloodbath, and it has been released as a movie (again?) starring Macaulay Culkin & Seth Green. I’ll likely have to wait until it comes out on DVD, which I think is in February 2004. It isn’t playing that close to me. But I’d probably read the book again, it was very funny. I also rented One Hour Photo (which was odd), and Family Guy Seasons 1&2. I love Family Guy! It’s hilarious, witty, and yet another gem that Fox didn’t keep on the air. Fox has an annoying habit of cancelling shows I like. Them & the WB. I wrote to Fox to encourage them to release more of their cancelled shows on DVD. Like Titus, Harsh Realm, or The Lone Gunmen. Oh, I guess I could write about my job at the museum. It was fun. My boss Jeff is cool, he reminds me of a cross between Kevin from KUCI, and Jamie Hyneman of Mythbusters. So far, I’m only working Mondays until I learn the ropes & stuff. Geoff & I are going to the museum tomorrow because it’s a free day, and I can’t wait to check stuff out. Science can be a lot of fun! I’ll close with a quote from Ghostbusters which was on this morning. I love that movie, Bill Murray cracks me up. Dr. Peter Venkman: Hee hee! “Get her!” That was your whole plan. I like it; it was scientific. I don’t know what stresses you out about Christmas, but I’ll share what does for me. It’s the anticipation of whether or not family will like the gift I chose for them. It’s important to me that people like the gifts I get them. They don’t have to be THE gift of the holiday, but to genuinely enjoy them. I will be on pins & needles until I see (or hear) their reaction. Now, I wouldn’t want anyone who buys me a gift to feel this way. I’m a very easy person to shop for. Not only do I provide a wishlist on Amazon, but I have several interests that make shopping for me easy. Rarely have I received a gift I didn’t like. The most infamous to those who know & love me, is the jar of mints. A gift I received from a boyfriend in the 10th grade. Now, I don’t like mints, not at all. So you can imagine my dismay that the boy I like buys me a jar of them. As a point of reference, we’d been friends for a year, and dating for 5 months. I gave him a Levi’s shirt. So, that being said, I have enjoyed almost all gifts I have ever received. This Christmas, our tree will be fairly barren of gifts, as we are celebrating Christmas with my in-laws after the 25th. But we can look at it as extending the opening fun. Thing is, last year, opening gifts didn’t take long, and then we were off to Disneyland for the day. This year, there is no Disneyland nearby, but we may try to go to a movie. We’ll see. It’s likely we’ll watch any DVD’s we get, and I know there will be some. I took the San Francisco pictures off my website, and will try to update most of my photos. But right now, I have to finish getting some gifts wrapped and ready to mail. I’ll close with a great movie quote about gift-giving. Stacy: Well, don’t you want to open your present? Wayne Campbell: What is it? Stacy: It’s a gun rack. Wayne Campbell: A gun rack… a gun rack. I don’t even own *a* gun, let alone many guns that would necessitate an entire rack. What am I gonna do… with a gun rack? Stacy: You don’t like it? Fine! You know Wayne, if you’re not careful, you’re going to lose me. Wayne Campbell: I lost you 2 months ago! We broke up! Are you mental? Your saturation level is very low – you have better things to do than jump headfirst into every little project. You make sure your actions are going to really accomplish something before you start because you hate wasting energy making everyone else think you’re working.